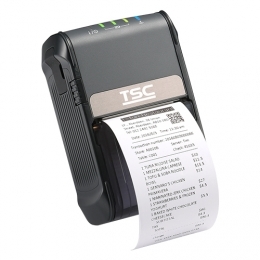 The mobile printer TSC Alpha-2R produces 58mm wide receipts, sales slips and tickets at the push of a button, at up to 102 mm per second. Thanks to its very compact size it offers all the advantages that go with it, plus the reliability and longevity you are accustomed to with TSC. The Alpha-2R features extremely stabile housing made of high-quality plastic, is IP42-certified with the optional protective case even IP54-certified and withstands multiple falls from heights up to 1.5 m 2 m with IP54 case. That makes it a truly reliable partner in the outdoors, even under adverse conditions. The practical direct thermal printer is a real lightweight in its class, weighing a mere 350 grams. Thanks to its powerful 1,620 mAh batteries it lasts up to 17 hours that means two consecutive uninterrupted shifts. The Alpha-2R is exceptionally variable and is fully equipped for communication and application diversity it features numerous interfaces, such as USB, RS232, Bluetooth MFi and WLAN, plus it supports all common emulations, such as ESC-POS, CPCL and ZPL.